Stephan Wolf (CEO) got to know Thomas Senkel (CTO) in an internet forum in a discussion on quadrocopters. Thomas Senkel specializes in the development of electric drives and the construction of ultra light vehicles. Alexander Zosel (CEO), a visionary entrepreneur and inventor, was sold on the idea of rescaling the model to the size of a manned aircraft too. Wonder how much one of these would cost? These guys backed by several partners including the University of Stuttgart are doing some amazing things with personal flying copters. It seems that they have now built what they call a Volocopter which is capable of carrying two persons. Still in final development during the summer, the maiden voyage is expected later this year. The same company have already demonstrated their proof of concept with a test flight in October 2011. That was pretty spectacular in itself. 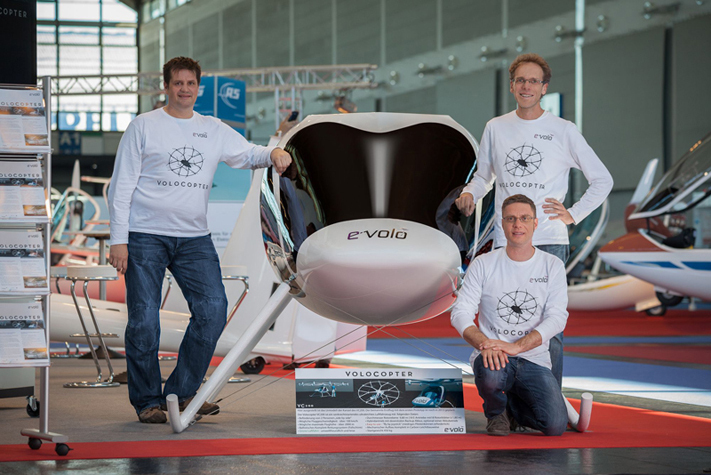 On October 21st, 2011, Thomas Senkel of e-volo made the first manned flight with an electric multicopter (VTOL), the so called volocopter VC1, at an airstrip in the SouthWest part of Germany. The flight lasted 90 seconds, after which the constructor and test pilot said: "The flight characteristics are stable. Without any steering input it would just hover there on the spot". I bet he said it was awesome as well. That's not in the video.